Well, we're kind of hemmed in today since we're waiting on the GE dude to come fix our fridge, which has died. Which is pretty annoying. But otherwise, it's been a great holiday. All my presents seemed to go over well this year, so that was nice. Go ahead, be the crazy relation that makes your presents. One day perhaps I'll be famous for my knitting and then all our nieces and nephews can sell that crap for big bucks. Anyhoo, everyone take it easy and have a happy and safe New Years. So, here's the start of the back of that big cable. As I started, well, call it 1.5 skeins in, I realized I'd made some major boo boos on my graph and had to rip out about 9 inches of work down to the ribbing. But I love it so much, it's worth it. I've also taken a snap of the amended graph and have replaced it in that earlier post. For some reason, I like the yarn in this color better than in the nephew's sweater - it's softer, I think. The color doesn't show well here, it's a sea green with flecks of red, green and cobalt in it. 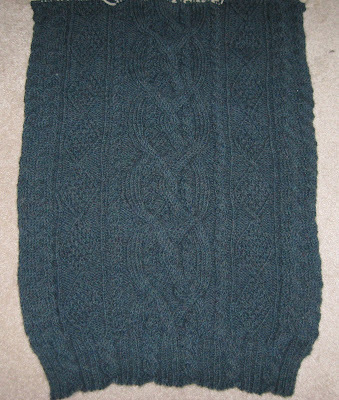 Very pretty and this knits up very evenly. 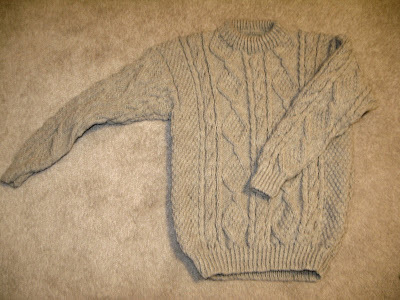 I've cut the size of the sweater down - the original pattern had a large and a medium size, this will be a small. Merry Christmas, hope everyone had a happy and safe holiday. Here it is, buttons on, blocked and everything. 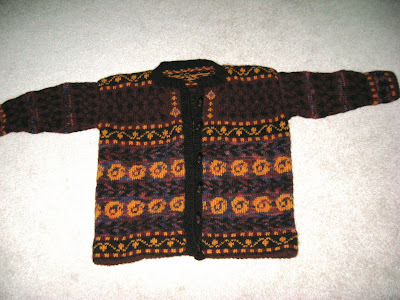 It's a very nice jacket - slightly felted so it will be quite warm, but still soft. This is a close up of the pattern, the whole thing is down below. Jo Anne Fabrics has better buttons than I thought. This project has been making think that some knitting projects are cats and some are dogs - I guess I mean some are self sufficient and some aren't. This one was a dog. I've now moved on to a more catlike project, more on that later . . .
Norwegian Roses, getting there . . . So, once I came to terms with the fact that Norwegian Roses wasn't going to get to my mom in time for Christmas, I felt better. I'm not rushed anymore, which is good, because that bugger is going to require some serious retrofitting to fit my 98 lb., 4'9" mother. I think I'm going to need to trim it back from the bottom - lop off a section of roses and geese and then reattach the bottom via a graft. If I don't, I don't think mom will be strong enough to stand up in the dumb thing. But first, I have to finish the second sleeve and tack up the bottom facing to see how long it is when it's all done. And I've really abandoned their ideas about what patterns to use on the sleeves. Just makin' things up, don't mind me. But I think I showed some restraint - I've only made the mittletts, rather than starting a whole new sweater, which is my usual M.O.. Please excuse these even worse than usual pictures - taking pictures one handed of one's own hand . . . I did a riff on Fetching here, nothing very exciting, but the Brown Sheep is nice, and I like to put them in the dryer for a few minutes to get them to pull together. The crochet is the edging - it's a picot edging I got from Vogue Knitting (I think this is the later edition of the one I have, it's a great book for technique stuff from finishing to design). It's not complicated, but it's a start . . .
Maybe a combined project next, maybe a shawl??????? Well, not really I guess, but I made it onto Ravelry. Cool! Too bad there's so much dental work, child sickness, cat wound-care/washing going on lately or I'd actually do something about it. So, I've started work on a pair of Fetching - but I'm using Nature Spun Worsted in Enchanted Forest. Nice and soft, but not cashmere. Leftovers from a Christmas sweater from last year. I'll take a picture when I have enough to make it worthwhile . . . . .
And so today, The Mad Crocheter asked for my input assembling a hat - which was fun. It's very cool to do that sort of problem solving, especially when the collective brain figures it out the first time around. She also showed me her caplet which is to die for, seriously, the thing is so soft and pretty, and that got me thinking of a couple things . . .
First, I want to do something cabley with Suri Dream - in the dark green. It really works up so nicely, lofty like mohair, but soft. 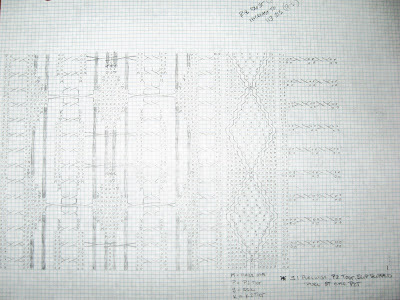 Second, TMC was teasing me about flaming out on a peice of lace I started last spring on her blog. And she's right! But I wasn't happy with it, so I tabled it. Its Alpaca Cloud in smoke heather and I adore it. But now . . .
What about a fitted caplet, working out in a star pattern? I have a book of knitted counterpanes that has some star patterns, maybe a sold yoke, then decending star or leaf motifs that increase out? I like that idea because just keep working until the yarn runs out. . .
Like all my charts, if you're interested in trying them out, they're all pretty much written for light worsted to worsted weight yarn - you could use anything from a wool blend to plain acrylic, I'm not sure 100% cotton would hold it's shape well against the weight of all the cables, but there's no reason not to try it - and I really like charts. 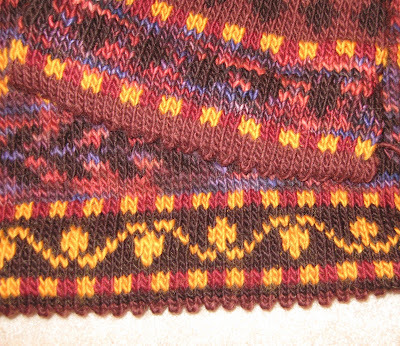 But this one lacks full directions - it's just the chart (or about 2/3 of the chart) for the front and back - only I did this one as a raglan. 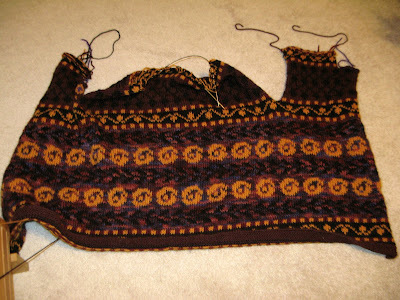 I started with a crew neck with a cable ribbing, added 1/5th of the total number of stitches to increase for the body, and set the pattern at a 2/1/2/1 division of all the stitches. I then increased on each side of the raglans every other round until it was big enough, took off the sleeves, joined the body worked to desired length, then picked up the sleeves and did standard decreasing to the cuffs. Anyway, if anyone wants to take a stab, I can write up better directions that that. It's getting there . . . So I'm just free handing the sleeves, I think it will all come together once it gets assembled. It's just not as bright as it looks here. And here is a detail of the picot edging - where I cut off the original garter stitch part which just wasn't working. I really like it - I think it works well even on worsted to heavy worsted gauge yarn. 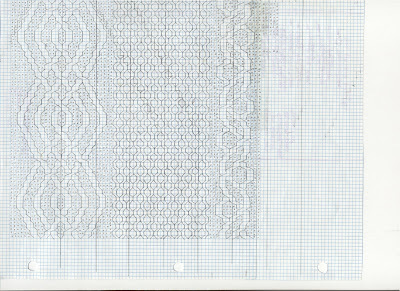 So, as it turns out Encore Worsted works pretty well for Lopi Lite patterns. The only adjustment seems to be that while the width gauge is okay, the row gauge is short, so you need to make some adjustments, but that's not that big of a deal. Anyway, it came out pretty nicely, just needs to be washed. In a machine! (clapping hands with glee). I want to use up all those bins and bins of stuff I have in the closet and today the Yarn Harlot had a link to these cool glove things - Dashing. Not interesting, no pictures, sorry, lame me. Knit Versus Crochet (ala _Mad Magazine_) in which I natter on and on and on . . .. Remember the two birds who were always blowing each other up? Yeah, I never really got Mad Magazine when I was a kid . . . So this, is nothing like that. Actually, it's all about getting along. The Mad Crocheter and I have been talking about knitting and crocheting for a few years now. In fact, I think I can lay blame at that door for even getting around to starting this blog at all. Some of the first conversations we had were about what's up with the knitting snobbery? How come crochet seems to get a bad rap? We kicked around various theories: knitting is more utilitarian because one uses it to make clothes; crocheting is more of purely decorative art (edgings on hankies, doilies, etc. ); knitting is more of a Northern/industrialized/puritanical pursuit (images of those stern faced ladies in mill towns making socks by candle light as it got dark at 4pm in the winter) while a more Southern pursuit (refined ladies doing fine work while socializing out on verandas); the socio-economic factor (your granny making afghans out of $1.99/in. skeins of acrylic versus Julia Roberts bringing her knitting on the set, all those designers writing patterns for knitting, working with tony yarn producers culminating in the knitting revival of the 80's and 90's). They were some mighty interesting conversations, but the more we talked, the more I became convinced that one of the main things bringing down the potential good name of crochet was that crocheters tended to use crappy materials. You see, T.M.C. would talk about going to Michael's for some Lion Brand for an afghan, and while there's certainly nothing wrong with that, I wondered what might result if they field of play were broadened for T.M.C.? I talked about the concept of hand and T.M.C. sort of gave me these funny looks, and confessed discomfort with "yarn snobbery". No, no, I tried to play it as a larger interaction of tool and use and lo and behold . . . So now I've seen T.M.C. make clothes, crocheted sweaters and hats and they ROCK, they really do, but man, they ain't made of acrylic. So today, I sent the shot across the bow about we should try to design patterns that have to use both - like a book of piano duets, it could be two person patterns - go find a knitter or crocheter and make these things, because you'll need someone who can do both. Strength through unity. Kind of a cool idea, I thought. Then, a snag . . . .
Hand again. T.M.C. 's stuff is really lovely, and the clothing is mainly cotton or cotton blend. But I find that stuff really hard to knit with; it hangs wrong, it stretches out, the necks look lousy, but for crochet, cotton and blends looks great. My theory: knit works best on wool blends because of the kind of fabric it makes, more drape-y,while crochet, which is basically made of knots, works better with plant fibers which create a softer, more supple fabric. Not a nail in the coffin lid of my "fiber-ists without borders pattern collection" idea, but something to keep in mind perhaps . . . Okay, the body is almost done - and I'm running out of the Sunburst Gold! Grrrrrr - I stink at math and I can't find Brown Sheep LBW in this color anywhere. So much for timing things to be ready for Christmas. The colors really show up better on this second picture, but I really love the piece as a whole. It's completely out of my usual comfort range of colors. I think I want to do this one in blues again - blue and green maybe? Or, do something with blues and this sunburst gold again, that would be really nice. Anyway, the sleeves won't take long once they get done and I should be all done with the body tonight. I've got my next Aran project waiting, the blue teal huge cable thingie, but we saw some of the second Bourne movie and I really like Joan Allen's sweater - it's a charcoal grey Aran - I think I want to make one of those. Basically, I think I need to convince my family to move to Finland so I can knit every piece of clothing we own.